In this illuminating audio experience, Deepak Chopra invites listeners to experience the therapeutic power of sound through language and music. In Volume One, Chopra explains how language forms our material reality and shapes our beliefs and behavior. Listeners are treated to a selection of sacred verses from the Bhagavad Gita that spontaneously generate insight, intuition, and inner harmony. In Volume Two, Chopra continues with a selection of hymns and prayers from an ancient Indian scripture, the Rig Veda. Filled with praise to the gods, the elements, and the bounty of the earth, the recording takes listeners on an unforgettable journey into the true nature of the universe. 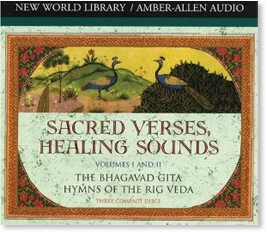 The more one listens to these sacred verses, the more one gains from the healing power contained within the sound of the verses themselves.